Studio versions of Eurovision songs don't always do justice to the songs. They can sound quite meagre compared to the version that was performed on stage - especially before 1999, when the orchestra was abandoned in the show. 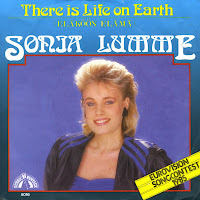 Sonja Lumme represented Finland during the 1985 edition of the Eurovision Song Contest with the song 'Eläköön elämä' - and yes, I have no idea what that means either. She finished ninth in a field of 19 competitors. She recorded it in English for this single. 'There is life on earth' was probably only a hit in Scandinavia.